I bet you thought I was going to talk about me, again. Well, while I am still on my sardine eating/fishy burp producing binge/experiment to improve my hair’s condition and thus give myself incredibly glorious hair, we are not going to talk about my own personal foxy locksies. Which would have a different spelling than this title, anyway. Our story begins when my daughter was going across the street to play with my neighbor’s granddaughter who comes by to play on a fairly regular basis. 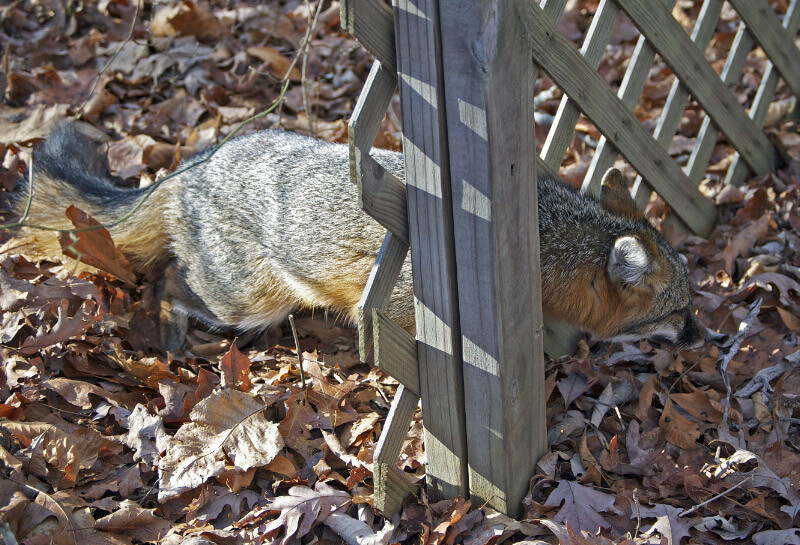 They were walking up our driveway (which, if you looked at the pictures in yesterday’s post, you will remember is quite wooded), when my daughter said she heard something rustling in the leaves. Over near where the propane tank used to be. We used to use propane to fuel our cooktop when we first moved here, and so we had a lovely, decorative, huge white/partially covered with green mold, torpedo shaped fuel tank in our yard, which the previous owner of our home had attempted to camouflage with some lattice work. Natural gas arrived in the Boonies last summer, the propane supplier hauled our ugly propane tank away (Yay!!! 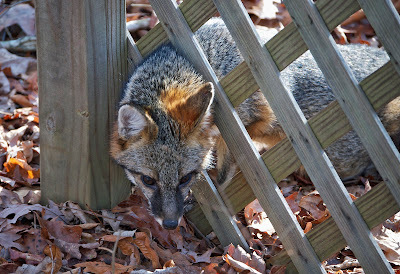 ), but the little lattice work “faux fence” has stayed up in our yard. Why? Well for the same reason that our giant Christmas bulb sidewalk lights (purchased this year at Costco for that festive holiday feel) still grace the sidewalk leading to our kitchen: because we live deeply back away from the road enough that we’re not particularly ashamed enough to take them down. So, ANYWAY, my daughter heard a rustling in the leaves. Her eyes, she tells us, got big as saucers, and she came running back into the house and called us to come see, quick, because she knew what she saw wasn’t going to last long! My Ear! My Ear!!! If this keeps up, Van Gogh’s going to want to paint me!!! No, seriously, there has got to be some way out of this dilemma. But my head is so wide and my brain is so TINY! Ow! Ow! OW!!! Oy, I got such a headache! Note my lovely Foxy Loxy Locks. Susan in the Boonies is so jealous, because I don’t have to eat sardines. 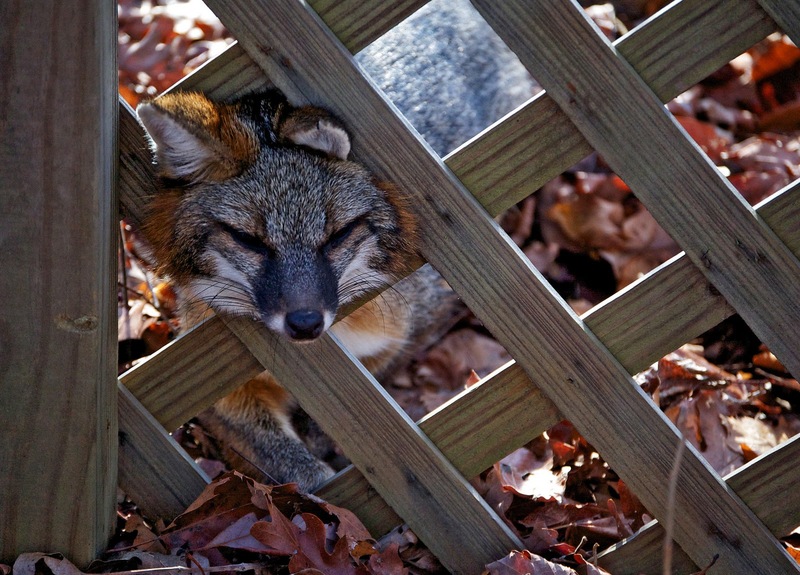 No, we don’t know how FoxyLoxy got his lovely locks stuck in that stupid faux-fence. Maybe he saw a mousie through the hole and decided to pounce on it, sneakily. through an opening in the latticework, and then couldn’t get through, or back out. We don’t exactly know. But well and truly stuck he was, and my dear husband, the awesomest Bison EVAH (!) , first got his camera and snapped some shots, and then got some kind of crowbar and pried one of those pieces of wood loose from the latticework, and freed dear FoxyLoxy. FoxyLoxy promptly ran around in circles in our yard for about five minutes. Our neighbor theorized that perhaps he ran around like that in circles because he was oxygen deprived from hyperventilating because he was STUCK (who knows how long he had been there before my daughter saw him! ), and all these people were quietly creeping up on him, looking at him. Poor feller! 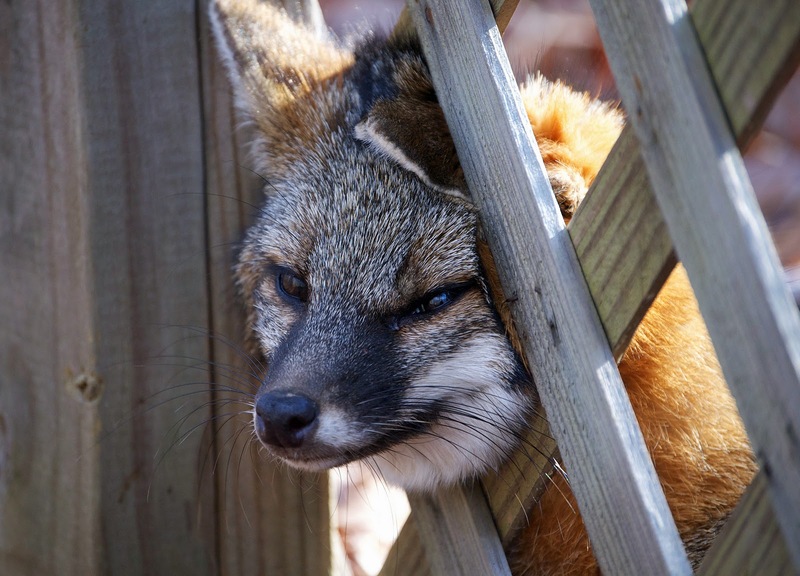 Anyway, within a few minutes, his right mind seemed to return to him, and he trotted off to do foxyloxy things in the Boonies. So, now, children, you know the story of How FoxyLoxy Got His Head Stuck in the Faux-Fence in the Boonies. Show your kids these pictures. They won’t believe it. I almost didn’t! And I saw FoxyLoxy with me own eyes.